The First Generation of the Internet was text based. As numerous colleges and government agencies notably were sending packets of information between computers creating the first computer networks, ARPANET was the first network that spanned multiple colleges and cities. This may have been the birth of the Internet as we know it. The Second Generation of the Internet is defined by web pages and multimedia. The creation of HyperText, mainly HyperText Transfer Protocol (HTTP) and HyperText Markup Language (HTML) allowed everyone to create and host graphic and multimedia extensive web pages. This was a key element in the birth of the Information Age and the Internet (Web) as we know it today. The Third Generation of the Internet is 3D Internet Browsing, or Walk the Web®. 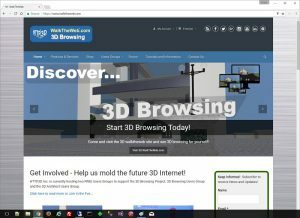 This stage in evolution of the Internet, invented by Dr. Aaron Dishno, provides a new interactive and animated presentation layer by standardizing the creation of 3D Building Websites and allowing them to Connect on Grids or Maps to create 3D Community Websites. Is this the birth of the 3D Internet Age?